Please feel free to email your request or issue that you need help with to [email protected], we aim to promptly respond to email enquiries from 8:30am to 4:30pm during business hours on Monday to Friday. Email allows us to provide technical drawings, information and a link to the part that you will require to undertake the repair job and be successful. In addition we have many video tutorials showing exactly how to identify the replacement part and even undertake the repair that we can easily link you to via email. We acknowledge it is nice to be able to talk to a human, unfortunately we cannot also provide a first class telephone service at the same time. Due to the technical nature of the products we deal with and some of the questions we’re asked, we soon realised that our experienced technical team were unable to provide satisfactory support as just a voice over the phone, sometimes an image or video can speak a 1000 words. With that in mind we have therefore invested in a very detailed website and in many cases we now even have a YouTube video tutorial detailing how to identify the replacement part you require, and then undertake the repair once you receive the replacement part from ourselves. If possible we ask that you attach a photo to your email, this is always helpful as a reference point and lets us see what you can see. Including as much detail of the issue as possible, including any relevant measurements will always help us to better help you. We can then hopefully respond with a link to the replacement part that you require, along with any technical information or videos you might find useful when undertaking the repair. 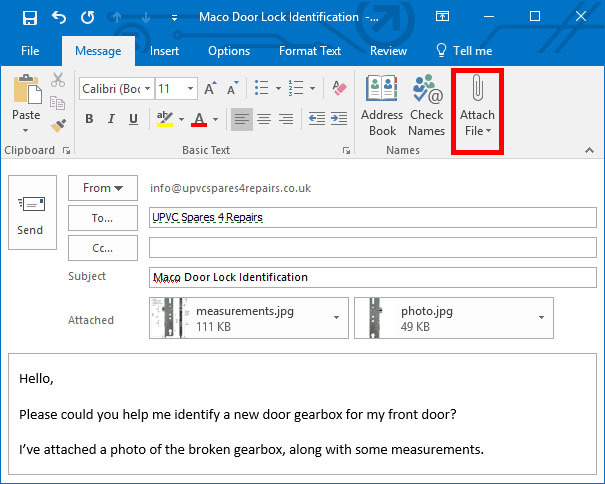 You can usually attach a photo / file to an email by using the paperclip icon as shown below, this will vary between the device your sending the email on. If you are having trouble sending us an image via Email you can also use Whatsapp.